Im a newbie just trying to nab a Bliss Bug 🙂 but Im not picky 🙂 I just received Wisdom Shared. I love it! Thank you for the beautiful treats! 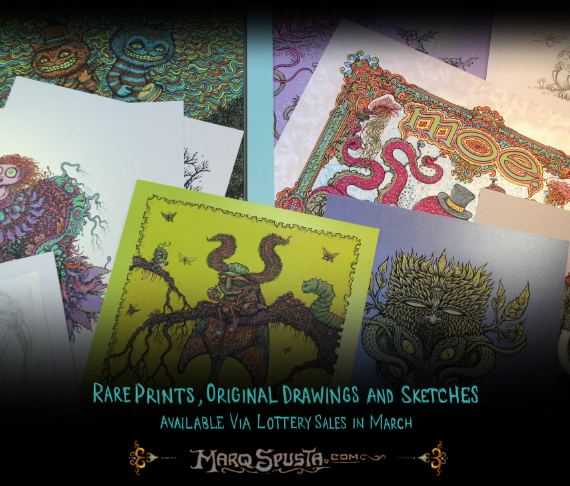 There will not be any Bliss Bugs in this lottery, but we do hope to get more Mini Bliss Bug prints in the Shop sometime in the future. I have an extra Bliss Bug. 15.00 plus shipping. Thought, I’d offer. Do you still have this? What condition? You are the man marq! Lot’s of amazing art in that picture. Good luck everyone. Cannot wait my friend !! Looking very forward to this. Good luck guys! Oh I can feel the excitement building and I just might burst. Hope to score something, good luck all !! In what consist lottery sales? As Bream asked, how does lottery work? oooooh purple primus!!!! let the drooling begin! Is that an OG Feathered Spirit in there? Good luck everyone! I have a Bliss Bug, for you. If, you’d still like one. Not, trying to make a profit. I have an extra. Thought, I’d offer. Yes! A Spusta March Madness Lottery Sales to welcome spring. Count me in please!! Hoping for some luck this time around. Sweetness! Thanks Marq! Can’t Wait! Oh how I hope my name is drawn. I have received a variant or two but never lucky enough to be picked for the lottery. Thanks marq for all your art and the excitement you bring to all of us Spusta fans. Oh, yeah! Some rocking Spusta art…..Good luck all!! Spusta Lotto? yes please. cheers! Would love to get in on this lottery!! Really looking forward to this. Thanks Marq! Count me in. Just hope I didnt miss out on it. How do u enter the lottery? Lottery?! I have two prints getting custom framed. So excited about this! Black Keys!! Purple Primus or OG for me! My Spusta wall is growing, still have room for one more.